Marcin Milkowski and Konrad Talmont-Kaminski, eds. The contributors to this volume engage with issues of normativity within naturalised philosophy. 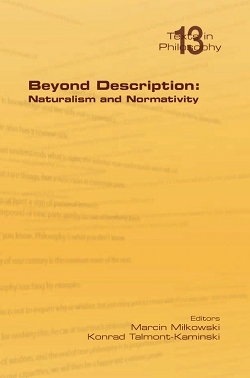 The issues are critical to naturalism as most traditional notions in philosophy, such as knowledge, justification or representation, are said to involve normativity. Some of the contributors pursue the question of the correct place of normativity within a naturalised ontology, with emergentist and eliminativist answers offered on neighbouring pages. Others seek to justify particular norms within a naturalised framework, the more surprising ones including naturalist takes on the a priori and intuitions. Finally, yet others examine concrete examples of the application of norms within particular epistemic endeavours, such as psychopathology and design. The overall picture is that of an intimate engagement with issues of normativity on the part of naturalist philosophers – questioning some of the fundamentals at the same time as they try to work out many of the details.